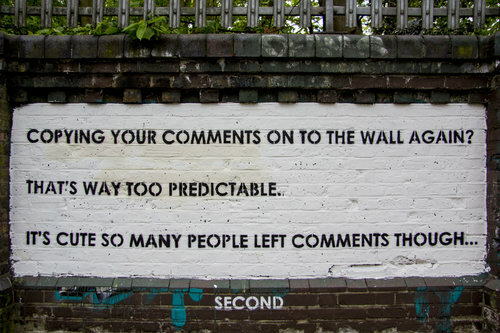 Mobstr is a London-based artist, famous for his playful and ironic, typographic based messages across walls and billboards. His extraordinary messages that have provoked a lot of attention in London. Whether he’s co-opting billboards, battling the local authorities or just having a little fun, Mobstr’s work is sure to bring a grin to any fan of street art. Driven by his instinct for subversion, Mobstr uses the urban environment to get his witty messages out there. His artworks are used as a tool in the critique of consumerism, advertising, and society as a whole. His words provoke thought and will no doubt leave a lasting impression.